Sometimes paintings take time to be realized. I’ve had a series of icebergs puttering on my studio desk since June when I made a series of small studies. I’m happy to finally share this one as complete! 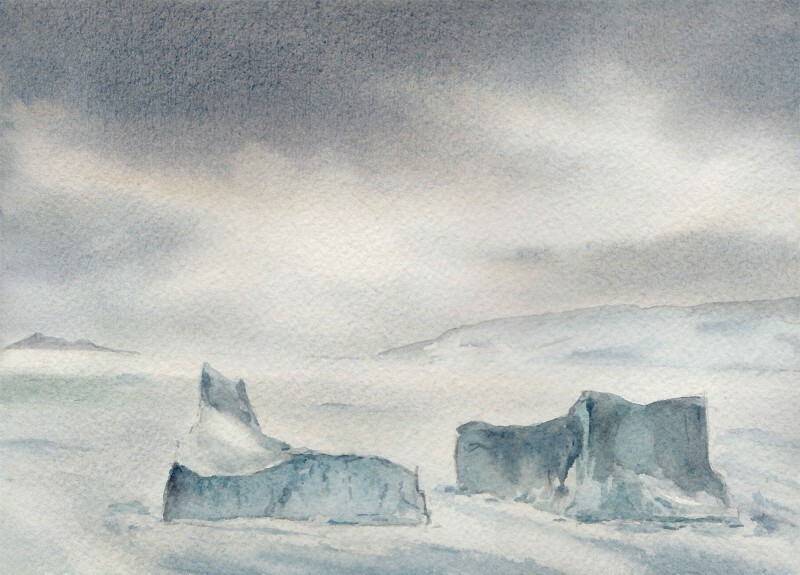 The painting is inspired by a photo I took during series of stormy days in Kullorsuaq, Greenland. First I completed a small study. 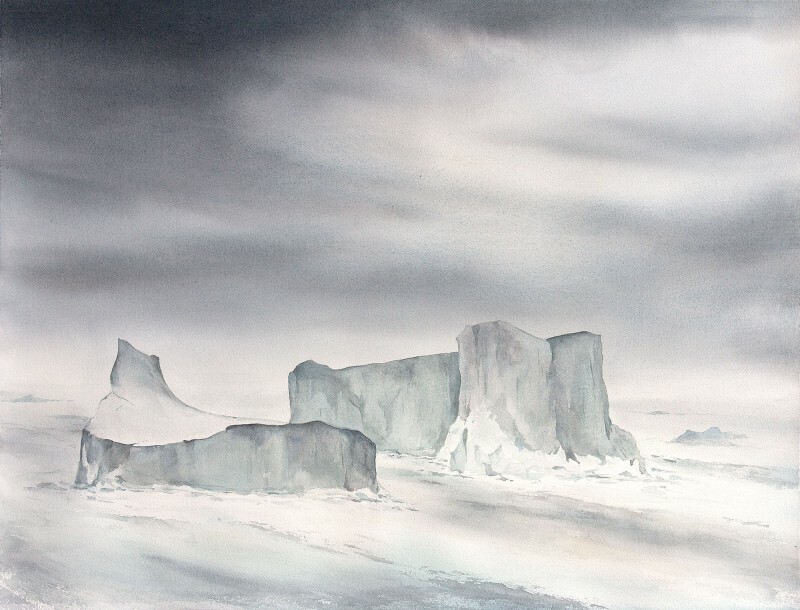 I worked with a limited palette, inspired by my field sketches and other iceberg paintings including Storm Front. Cerulean Blue Chromium, Deep Scarlet, Raw Sienna, Phthalo Green (green shade), and Indanthrone Blue. While painting, I keep watercolor paper scraps on my desk to explore and test colors. It always feels good to finish a painting! This one will exhibit this winter in my Imaging the Arctic exhibition at the Nordic Heritage Museum in Seattle. Maria, we found your art after reading “Myths of the Tusk” by Dr. Laidre and O. Curtsinger (the son of a friend of ours here in Port Townsend). 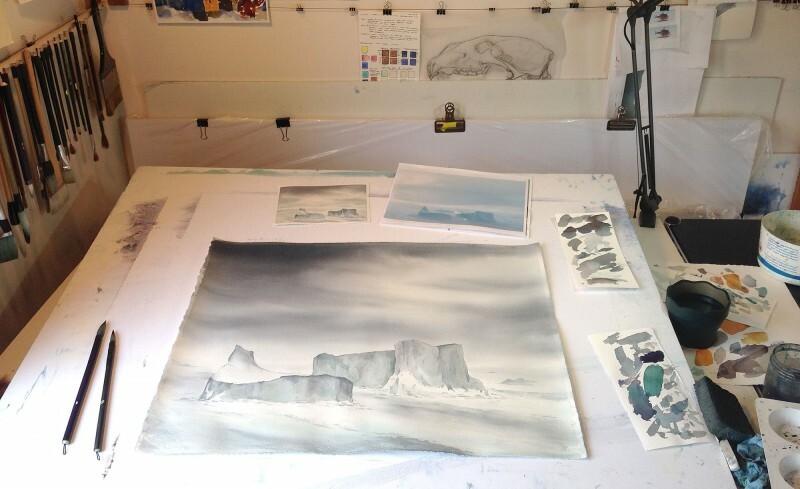 My six-year-old son says, “It helps me to imagine what the life of a polar bear is like.” I love that you posted a photo of your studio desk. Thanks for sharing your art. We are your admirers! Hi Maria, next time I’m in your pages. Great! I see here your studio and so I ask to you: what light do you use when there is not the day light, please? I’m old and my eyes are not more very good so I need a lot of light if I wish to watercolor or design in the evening when I have more time only for me. I’m a Mediterranean Italian woman so I love light! Thanks! Hi Luisella, I use two bright fluorescent blubs and an Ottlite natural daylight lamp. Lighting is tricky, I do prefer to paint during the day when possible.